Clearwater is excited to announce the upcoming delivery of Integrated Water Management (IWM) capacity building to Regional Victoria, thanks to the 2-year funding received from the Department of Environment, Land, Water and Planning. This joint initiative aims to increase participation and uptake of IWM practices in regional Victoria by engaging with local government, water corporations and catchment management authorities (CMAs) particularly. It directly contributes to the Victorian Government's recently launched plan for water management, Water for Victoria; in particular Chapter 5, where IWM is a key feature in developing resilient and liveable Victorian cities and towns. Our 14-year track record in building IWM capacity allows us to hit the ground running and deliver tailor-made, high value service offerings to support the uptake of IWM across the regions. 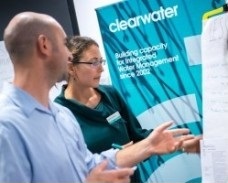 To kick start this initiative and support IWM leadership in regional Victoria, Clearwater is offering 3 x full scholarships to regional participants to undertake the highly esteemed International Water Centre Water Leadership Program. If you think that you or a colleague could benefit from this opportunity, have worked in the water sector for at least 3 years and are based in a Victorian regional Council, Water authority or CMA, then apply before November 9. We have undertaken targeted engagement with the regional water sector to verify existing capacity needs in order to deliver improved IWM practices. The findings generally corroborate the needs identified in our previous needs assessment (2014): All stakeholder groups supported a very high need for improved capacity around costs and funding of IWM, improved IWM legislation, regulation and policy tools, as well as collaboration and coordination between organisations. Using this in-depth understanding of the challenges faced by the Victorian water sector, Clearwater will develop a targeted and practical regional implementation plan, which will be rolled out in January 2017. Feel free to share this announcement with other stakeholders you might think will value from our ongoing correspondence; sign up to our regular industry news updates or contact Clearwater.